This page is a translated version of the page Goliarda and the translation is 100% complete. Goliarda was born in the '20s as an Ancora sub-brand dedicated to production of economic pens for the student market. Its pens were cheaper when compared to the corresponding models marked Ancora but still were elegant and well made. The exact date of the production start with this brand is unknown, we know only that the trademark request (Reg. Gen. N. 47915) was done in 1933. The first pens produced under this brand were simply safety models in black chased hard rubber, in the same "flat top" style of Waterman 42. These were produced in four different sizes, and weer imprinted with "Goliarda - Marchio Depositato" on the barrel, and there was no reference that could be traced back to Ancora. 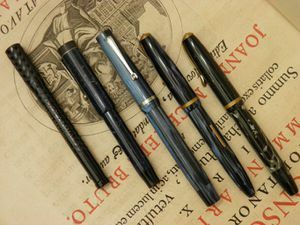 Later, around in the '30s, a new series of celluloid pens was made, with the same style of the contemporaries Ancora models, with very simple chrome or gold laminated trim and a jagged or flared clip. The Goliarda models of this type were a good size and equipped with lever or button filler. With these new models there always was the inscription "Goliarda" on the body, but placed above the classic anchor Ancora logo, that clearly indicated their origin. A further reference to the parent brand was present on nibs, the gold ones were marked "Warranted", but as for the one used for Rapid was present on them the logo of the anchor and the initials "G.Z. ", on steel nibs instead ware present only the "Goliarda" word in block letters. The production under "Goliarda" brand continued even after the war, still for economic and educational lines, and is believed to have been kept until the 70s. This page was last edited on 14 January 2019, at 03:23.